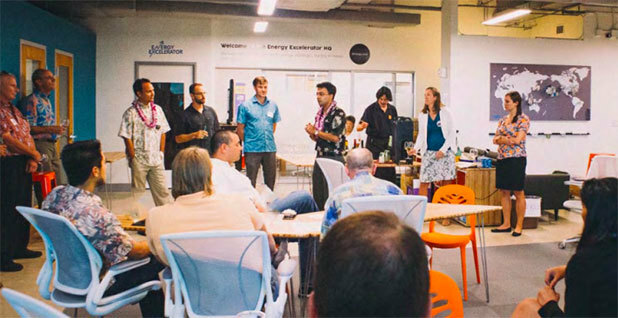 Startups meet in the Honolulu office of Energy Excelerator, where leis are standard issue. Photo courtesy of Energy Excelerator. HONOLULU -- Hawaii is an exotic species in the world of energy. On the one hand, it's tiny, an archipelago thousands of miles from anywhere. On the other, it's big: a U.S. state that is home to 1.4 million people, a tourist destination for millions more, and home base to one of the world's largest naval fleets. A business incubator called Energy Excelerator is using that contradiction to maximum effect. Based in a high-rise in downtown Honolulu, it is mentoring and funding young energy companies, both local and from away, who see in Hawaii's big smallness an opportunity to test out their business models. "You've got this unique, geographically isolated community, and you've got the scale to test these technologies," said Michael Pfeffer, the CEO of a company called Ibis Networks that makes devices that measure plug loads, now installed in several buildings at the University of Hawaii. He has a tan and wore an orchid-print shirt. "It's a small place, but it's got everything going on," he added. Over the past four years, Energy Excelerator has brought 42 companies under its wing, doing something unusual: using Department of Defense money to run an "accelerator" dedicated to bringing energy technologies to market. Accelerators take on startups for a specific length of time and provide both seed money and advice, in exchange for a portion of the company's stock. The organization started with $11 million of funding from the Department of Energy but now exists principally on a $30 million grant from the U.S. Office of Naval Research. Earlier-stage companies get $75,000 for an eight-month program, and later-stage companies get up to $1 million for a mentorship that lasts up to 18 months. In return, both groups provide 1 to 6 percent of their equity. The Excelerator is an arm of the nonprofit Pacific International Center for High Technology Research. It has proved to be a popular idea: The accelerator now receives hundreds of applications from companies each year, lured by cash and business opportunity, and also perhaps by the prospect of early-morning surf sessions and late-night karaoke. Only 15 or so are accepted each year. Beyond the swaying palm trees and leis, Hawaii has a powerful draw for clean energy startups. Its grids are Goldilocks-size, small enough for a startup to make an impact but big enough that the lessons can be applied to larger, mainland power grids. The state has passed legislation requiring its utilities to get 100 percent of their energy from renewable sources by 2045, which is far more ambitious than any state. Adoption of rooftop solar is among the highest in the world. Most important, electricity costs three to four times more than it does on the mainland, because up to 90 percent of the fuel is oil and coal shipped from abroad, according to Hawaiian Electric Co. That means a business that proposes to save energy costs can find eager customers, and profitability, more easily than on the mainland. It's an inverted version of that saying about New York City: If you can't make it here, you can't make it anywhere. "We are trying to create a rich soil to try, fail again, try, fail again," said Jill Sims, a co-founder of the Excelerator. Before launching the Excelerator, Sims worked for four years managing energy and energy-efficiency research and development and demonstration projects with DOE in Colorado. Her co-founder, Dawn Lippert, was an alternative energy analyst for Booz Allen Hamilton. When they founded the accelerator in 2009, they hewed to a familiar DOE model by funding 10 energy demonstration projects, and at the end asking for a business plan. But, they said, that didn't seem to get them any closer to solving Hawaii's pressing energy problems. So Lippert and Sims toured accelerators around the country and, in 2012, did a reboot that essentially reversed their previous approach. They sought the best young businesses, ones that at least already had a working prototype, and funded them to solve specific problems for the islands' major energy consumers, like the electric utilities or the military's U.S. Pacific Command. They determined to mentor their companies longer than a typical accelerator, which usually sends a startup out the door after a few months. The accelerator sought 20 percent of companies that were island-grown and 80 percent from the mainland, as long as they intended to do a major project on the islands. The Hawaiian energy market is, by all accounts, a difficult one to crack if you're an outsider. "In Hawaii, where everything is based on who you know, being part of this program has been incredibly, incredibly important," said Scott Cooney, the founder of Pono Home, an Excelerator company that does broad energy retrofits of homes. "The thing out here is if you don't have a soft introduction to those folks, and if someone isn't vetting your system, it's a much harder sell." That's about right, said Shelee Kimura, a vice president for Hawaiian Electric Industries (HEI), the principal electric utility for the islands of Oahu, Hawaii and Maui. "They talk about six degrees of separation," she said. "In Hawaii, it's probably two." A key benefit of the Excelerator program is face time. In one intensive week, Geli, a San Francisco energy storage software company, got meetings with the CEO of HEI, the chair of the public utilities commission, several local solar rooftop installers and the heads of energy procurement for several military offices, said Andrew Krulewitz, the company's marketing director. Despite arriving only in 2009, the Excelerator is already fastened in many ways to the island's energy networks and power structures. A senior adviser is Maurice Kaya, who was director of the state's energy program for a decade. Lippert, the Excelerator's co-founder, is also chairwoman of the advisory board at the Hawaii Clean Energy Initiative, which is steering Hawaii's zero-carbon goal. Connie Lau, the head of HEI, is on the Excelerator's strategic advisory board, and HEI has invested in the accelerator to the tune of $250,000. One role the Excelerator plays that most accelerators do not is in molding policy. An example is Stem, an energy storage firm based in the San Francisco Bay Area that is an accelerator member. Its project is to store 1 megawatt of energy among 20 commercial and industrial businesses. To tie this into time-of-use pricing, the Excelerator worked with HEI to get a pilot rate approved, which also requires the imprimatur of the PUC. Pfeffer, of Ibis Networks, said, "You're going to get a meeting. You're going to get a follow-up meeting. Everybody knows everybody." The Excelerator mostly focuses on energy through such companies as FreeWire Technologies, which turns retired lithium-ion batteries into mobile energy-storage stations, and TerViva, which grows crops that could be converted into biofuels or made into animal feed. But that focus is expanding. In the most recent cohort are two startups whose aims are to save water, and one, Lastwall, that is the accelerator's first cybersecurity company. A slowly evolving shift is underway from a solely North American focus to one that takes advantage of Hawaii's location in the center of the Asia-Pacific region, Lippert and Sims said. Last year, Denso, a Japanese conglomerate that is one of the world's largest auto parts manufacturers, signed on as a corporate sponsor. This week, Sims and Lippert are in New Zealand meeting with Vector, one of the island nation's largest utilities. Applications from new suitor startups are starting to trickle in from Australia, where one of the accelerator's companies, Bright Light Systems, landed a contract to supply the lighting for a new container terminal at the Port of Melbourne. "Hawaii has this opportunity to be the green hub for the Pacific," Pfeffer said.